gst-parts has no other items for sale. Please pay after you purchase our items and we will ship it to you as soon as possible. 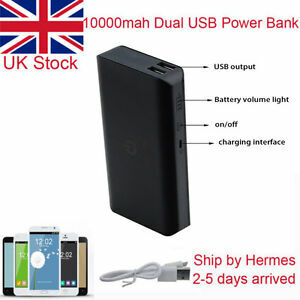 This is a great power bank with a large capacity, two outputs, a power level indicator showing 25, 50, 75 and 100% . It also guarantees against short circuit and over-charging. The included cable doesn't fit iPhone so you will need a separate lightning cable, and it doesn't include a USB adapter to plug it into. Size and weight are typical for a power bank of this capacity and it is best suited to go in a bag rather than a pocket. Charge lasts and stores well. The power bank is as described. It is very easy to use. I just plug the charging cable to the micro usb port and connected to my normal charge on the mains. It starts to charge with the LED flashing to show you the progress of the charging. Once it's fully charged, the 4 LEDs will be constantly on. There are 2 USB output, one is with higher current so can charge phones/pad faster. The 4 LEDs will indicate how much power still remains. After the charging started, the LEDs will turn off and you have to press the button once to see the LED light again. I have charged my mobile and it only used 1/4 of the power bank's capacity. Very useful power bank! This battery bank is excellent value for money, well built and charges phones very quickly. The size is not too bulky and there are 2 USB slots with 1 that charges super quick which is particularly useful. I would recommend this product to everyone and at this price, you can't go wrong. Bought to recharge phone when out and about walking using navigation. It's a lithium ion battery which charges my (3000mAh) phone more than two times, from about 15% to 95%. Phone battery charging is quick and apparently controlled by on board safety devices to prevent overcharging. The 'power bank' is slower to charge up but this is not a problem. The charge indicator lights work as expected to show when it is charged up and when it is discharged. Initial thoughts, good product delivered promptly at very reasonable price . A useful thing to own. I bought this external power bank to replace my old one,it is amazing so far it charges up quick and can fully charge my phone fast(iPhone 7) at least 3 times, which is great because I can keep it in my bag for a few days without having to recharge every night.I am happy for the price!! !